Should I have killed Martin “Le Black”? In last night’s game, while the party was fleeing a horse-sized giant scorpion, stalwart party member Martin “le Black” held the back of the line to give the others time to flee up a stairway. His player asked me if he could get some bonuses to AC for fighting purely defensively, having the high ground, and being better able than the giant scorpion to maneuver through the close confines of the rubble-choked stair. “Sure,” I said. But it was late and I was tired, and I didn’t actually determine what the modifiers would be. I just rolled the dice. 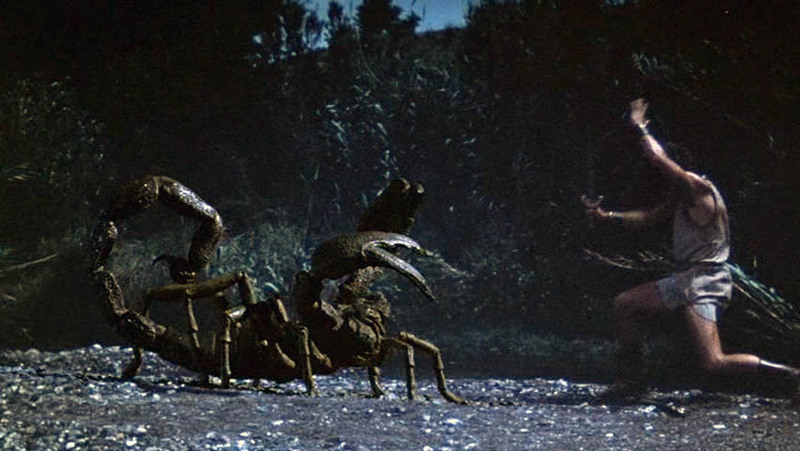 The attack roll for the giant scorpion’s stinger was a 19. Was this a hit? I didn’t know. Probably it should have hit—almost certainly, really—but that was meaningless when I was deciding on the modifiers after the fact. If I’d chosen the modifiers beforehand, this would be letting the dice fall where they may. Now, however, it was pure DM fiat either way. I thought for a moment. If the attack hit and Martin blew his poison save, I’d be killing a PC by fiat. If the attack missed, I’d be going soft on my players, and that’s a violation of social contract; the old school DM must be harsh but fair, and this would undermine that crucial harshness. The scorpion in our game? Bigger. In retrospect, the best choice would have been to discard that attack roll, solidly establish the ad hoc modifiers, and then roll the attack again. But I’m not embarrassed by my choice. Strictness isn’t a goal in and of itself; it’s a means to an end, and its goal is a more enjoyable play experience at the table. Player characters should never die for ambiguous reasons. Killing Martin while I was playing loosey-goosey with the rules would not have made things more fun. The lesson I’m taking away from this is not that I need to be harsher, or that I need to kill off a PC to make up for it. The lesson is that letting the dice fall where they may only works if you know what the roll means before you let the dice drop. From a roleplay perspective, all these bonus conditions are practical considerations made by the character to face off an opponent perceived as much too tough to fight – safe to say he would be optimizing defense. While technically one should be able to retroactively tabulate bonuses, it’s pretty hard to be TRULY honest if you’re vested and know what the target numbers. Personally, I think you made a great call. Needless to say, with a character as charming and well personified as Martin Le Black, even “cheating” to keep him alive is not really cheating (editors note: I was playing this character, also, I’m not an editor). Never kill Martin! Number one rule. I understand the hesitation, but feel you adjudicated correctly. Martin was fully defensive, in a environment built for defense, he is an expert on poisons and is fully aware of the tail’s power, so was using his shield primarily against its jabs, and… I think scorpions can sting the poison out of their stingers at times. Don’t remember if he had stung the bird creature, and he might have scraped it against the walls. I think judging that the stinger had hit, yet more of a bruising hit, made a lot of sense. It’s a tough call. What was the margin on the (unadjusted) attack roll? If the scorpion rolled a 19 when all it needed to hit was a 3, I’d be pretty comfortable calling for a poison save even though I hadn’t calculated the defensive adjustment beforehand, because it’s unlikely those modifiers would make any difference to the outcome. Generally though in close calls like that, the player should benefit. He or she has invested in the game and made contributions every bit as vital as the GM’s, has taken time out of their night to play (often juggling other commitments), etc. etc. Not giving them the benefit when the GM screwed up seems kinda mean-spirited. Besides, there will be plenty of opportunities to fairly slay the character later. Shorter Eric Minton: my player wanted to act heroically, but didn’t want to take a real risk. If your char. can’t die by staying behind and heroically letting other players escape, when is a good time to “let” a character die? Bargle, Eric isn’t saying that the player “didn’t want to take a real risk.” There’s no whining coming from the player here. It’s the GM trying to figure out a judicious outcome. The mechanical inputs broke down due to GM error and the fictional inputs were ambiguous, and since it was a finely calibrated situation it became impossible to determine a “fair” result. At that point, I think you’re left with policy considerations. My view is that when the GM screws up, and it could easily go either way, let the player have it. I can see some justice in that, but it presupposes that PC’s should be gettin’ killed off as the default: i.e., in a dangerous situation you should assume that the character will die. But I think it’s an equally persuasive assumption that characters will survive by the skin of their teeth, and more fun to watch. Nobody’s taking away the lethality of Old Skool play. Just saying, it doesn’t need to be lethal when it doesn’t have to be. Can I point out that Martin wasn’t actually all that heroic, he was just slower than all the other characters? Anyway, Eric had basically said that the scorpion was likely to hit only on a roll of 20. But then the borderline 19 came up. I think it’s fair in that instance to say the tail did hit but not in a way that injected poison. His description was that the tail hit Martin on its backswing, which I think was a brilliant improvisation. Like dude said, if the margin was 10 points it’s probably going to hit despite the situational bonus. No clue about full defense, but high ground shouldn’t be more than a point or two. And unless the poison was instantaneous, he’d have time to get back to his fellows to get healing before the poison killed him. But it’s still so sticky, because what if the roll was very close but you hadn’t thought of what modifiers to give him? You could leave a choice up to him – explain that the monster probably hit but you didn’t consider what his modifiers would be before the roll. So he gets a choice – either the monster hits him, forcing a poison save, or the monster snatched his weapon out of his hands. That sort of choice, totally ad hoc but it’s a chance to save him because you goofed. Then again, it was the party’s choices that got them into those circumstances. The scorpions have various rewards for defeating them, possibly tied to the difficulty of slaying or avoiding them. And one player choosing to save his friends and stay behind to slow down the enemy is choosing death with a slight chance of survival. Otherwise the scorpions would pursue and possibly kill him anyway, along with others. I had this sort of thing happen last month. One guy split off and angered some mushroom-men by killing their babies, and was separated from the party. The mushroom-men should have just killed him off (rolling, of course, but it was a really unbalanced fight). But they let him go, which I think might have cemented the idea of their peacefulness and neutrality. But it was because at that moment I didn’t want to just let him die. Turns out his foolhardy adventuring tactics got him killed last weekend. Nine out of ten times his “I drink from the fountain” or “I jump into the pit” don’t turn out that badly. But looking back, making him survive by DM fiat might have taught him a lesson that doesn’t really exist. Same excuse though, tired and discombobulated DM makes several dozen pivotal decisions and ends up with one that was “fair” but not impartial. I definitely think you made the right call, though I am of course biased (being the player of not only Martin’s fellow party member, but the fighter who’ll be reasonably expected to take the most risks if Martin buys it! ), for exactly the reason you cite: Killing Martin while playing loose with the rules would not have made things more fun. The resulting chase up the stairs, on the other hand, did make things more fun. A scorpion the size of a horse clambering down a ruined tower, rushing past a party disguised as a hedge before getting gunned down by archers from behind was pretty cinematic indeed.